Firth House care home in Selby has become the first care home to complete the React to Red training being promoted by Vales of York CCG. Staff at Firth House on Firth Mews were presented with their certificates by Chris Pomfrett, Assistant Practitioner for the React to Red programme. Chris said “Pressure ulcers are a major cause of harm and distress. They affect around 700,000 people every year, yet many pressure ulcers are avoidable if simple knowledge is provided and preventative best practice is followed. 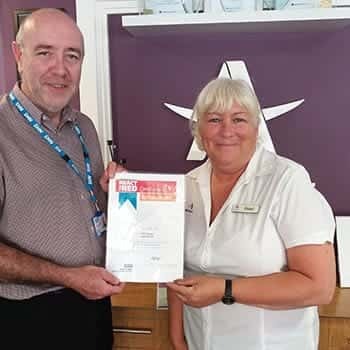 "NHS Vale of York Clinical Commissioning Group (CCG) is committed to supporting carers in providing best care and has been participating in the NHS England work to roll out the React to Red initiative to care homes. "The package uses a simple yet effective framework which supports carers in recognising when an individual may be at increased risk of pressure ulcer development and the simple steps that can be taken to avoid them. "It has been a pleasure to work with the staff at Firth House to roll out the package and I am delighted that 100% of staff have now completed the package. Congratulations! Home manager Pearl Millin said “It’s been fantastic working with the React to Red team and all of the staff at Firth House have found the training interesting. "We pride ourselves on the care we deliver so we’re always looking for more training and better ways we can improve our service. "This has been a great example of health and social care working together to ensure our residents are safe and happy." For more information on Firth House please contact manager Pearl Millin on 0800 0854296.